A former Republican running as a left-wing Democratic candidate for Baltimore City Council is promoting fake news and hate as part of his Facebook feed. BIG FACTS, Y’ALL. More #foodforthought: more Muslims have been killed by trump supporters in the last seven days than #Americans have been killed by #refugees from #muslimban countries in the last 30 YEARS. #webelong #refugeeswelcome #nomuslimban #nowall ✊???? Heilker is, by implication, suggesting that President Donald Trump was responsible for the horrific shooting at a mosque in New Zealand. Leaving aside what any of this has to do with running for the Baltimore City Council, let’s take a look at the graphic itself. The photo claims “Every Act of Terrorism in America for the Past 2 Years was Committed by Trump Supporters.” A very basic look at the facts shows that this is clearly fake news. The Congressional Baseball Shooting, which was officially described as “an act of terrorism…fueled by rage against Republican legislators“. A church shooting in Tennesee, which the Southern Poverty Law Center described as inspired by groups such as the New Black Panther Party, Black Hebrew Israelites, Moorish Nation, the Nation of Islam and other radical groups. An ISIS-inspired attack in New York City. It took a whole two-minutes to debunk this nonsense. In 2015, during the uprising, Dave saw the emergence of visionary leaders who wished to improve a hurting Baltimore. He believes we have come to a pivotal moment in our history, and that we must take this time to point ourselves to the future. 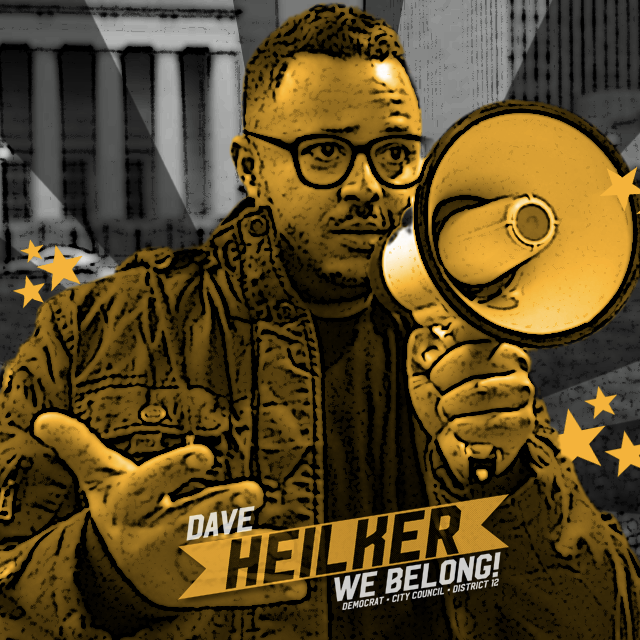 Ironically, Heilker believes that Baltimore needs to be an “inclusive city where everyone feels a sense of belonging.” But apparently, that does not extend to people who are Trump supporters, since Heilker implies that everybody who supports Trump is a terrorist. Heilker doesn’t just pigeon-hole his hate on his campaign Instagram. As the person behind the @charmgritty Twitter account, he also throws up some whoppers there too. This is why white supremacists dress in khakis and polo shirts. You, an enlightened, “civil,” white conservative: Why are you so angry? Let’s just agree to disagree. You don’t have to be such a prick. He has also bought into the debunked Democratic narrative that Larry Hogan “hates” Baltimore City. Your “moderate” governor is looking the other way while the GOP electeds in his state commit acts of violence against the poor every. damn. day. This is a good time to remind you that Larry Hogan got a higher percentage of the vote in Baltimore City than any Republican candidate in 50 years. Heilker also tweeted a completely made up and high offensive story implying that we at Red Maryland blamed the Capital shooting on the nomination of Ben Jealous. Now I’m clearly not the biggest fan of the President, and I will agree that some of the terrorist acts in this country have been conducted in Trump’s name. But when you see a candidate for public office painting such a broad brush by implying that Republicans are terrorists, and you take a look at his Twitter feed full of fake news and nonsense, Heilker is actually promoting the same hate and intolerance that he purports to be against. Of course, given the fact that the Democratic Party Chair is accusing Republicans of being white nationalists, Delegates casually use racial epithets, and the Democratic Party Secretary is accusing gun owners of being domestic terrorists and threatening them with doxxing, maybe Heilker is just the latest poster child for the modern Maryland Democratic Party hate machine, so all of this will probably play well with voters in a Democratic primary being that is tantamount to being elected that’s being held along with a contested Democratic Presidential Primary.